iPad rumors have been rare for months, but April showers seemed to have caused them to burst into bloom. Photos and a stock analyst's rather unsurprising predictions gave the iOSphere an unexpected thrill: actual rumors about the next generation iPads, whether you call them iPad 6 or iPad Air 2 or iPad mini with Retina 2, or as we'd prefer for simplicity's sake, "iPad 2014." A Dutch site received Chinese photos that English speakers replicated eagerly, purporting to show the "integrated display" for the next 9.7-inch iPad. And the fecund mind of KGI Securities stock analyst Ming Chi Kuo, with a single recent Note To Investors, fueled multiple rumors and speculations about Touch ID, the A8 chip, and more, even though he didn't say anything really new about any of them. iPad Air 2 to have "integrated display"
"You can hardly imagine, but it seems that the next generation iPad is even a little thinner than the iPad Air," begins the rather breathless post. 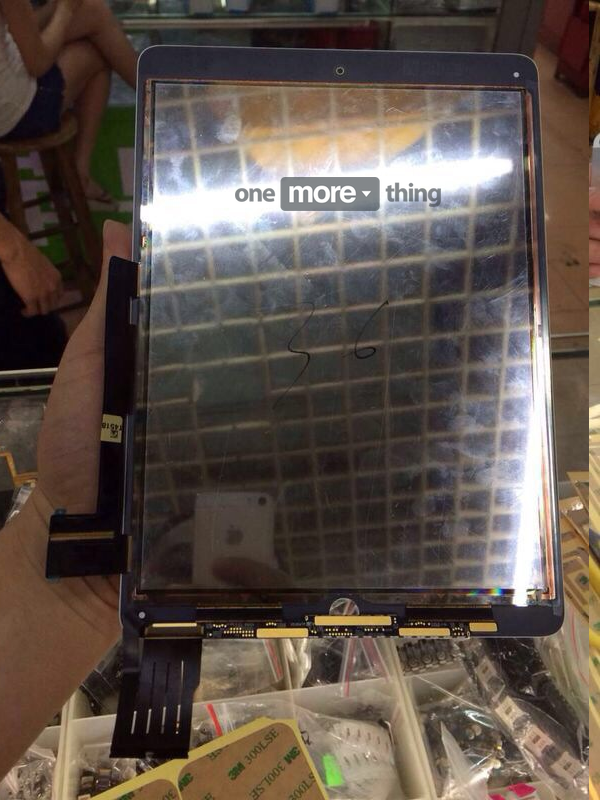 "This can be deduced from China leaked photos of a new iPad screen that OMT has received." The iOSphere went rather gaga, because this is one of the few Next Generation iPad rumors that have surfaced in recent months and didn't depend on a single Note To Investors by Ming Chi Kuo, stock analyst with KGI Securities. The term "integrated display" seems to be a reference to what's called in-cell technology; that is embedding the touch sensors within the cell of the underlying LCD display. Conventionally, the touch sensor and display are two discreet layered assemblies one atop the other. In-cell makes for a thinner, possibly lighter unit, with fewer layers and hence with less reflectance, and with greater brightness. Apple uses in-cell technology for the iPhone 5 and 5s (and 5c) but hasn't used it in either the iPad or the iPad mini. This photo is getting a lot of play in the iOSphere. You're looking at what seems to be the "back" of the alleged iPad's display assembly, without the outer, rear aluminum case. On the other side is the familiar iPad front bezel and the glass front of the screen. OMT says the photos came from a Chinese company that supplies components to some other companies in the Apple supply chain. That's not much of a recommendation: We could be looking at a prototype that didn't make the final cut and ended up in the scrap bin. But OMT did show the photos to iRepair4u, described as an "iOS repair from Bladel with experience in import of spare parts for iPhones and iPads. According to "experts of the company," the photo shows "almost certainly an authentic iPad screen...."
"In the pictures, the glass front of the iPad to see which is dimensionally identical to that of the [existing?] iPad," according to OMT, via Google Translate. "However, the connectors located in the back in a different place. More importantly, however, is that the LCD layer is already in the glass. That is the current iPads not the case." An overall thinner display means that "Apple would then also be able to choose to use more battery power," according to the optimistic authors at OMT. Earlier this month, the indomitable Ming Chi Kuo, stock analyst with KGI Securities boldly predicted that the 2014 iPad models will feature a home button with the integrated Touch ID fingerprint sensor introduced in the iPhone 5s. Kuo, as usual, made his predictions in a Note To Investors, which was picked up and replicated through the iOSphere by sites like MacRumors. Richard Padilla's post on the Note included a quote from the Note: "We think the upgraded iPad Air will be launched earlier in 2014 than the iPad Air was in 2013. The biggest changes will be A8 processor, Touch ID (fingerprint recognition), and main camera resolution of 8MP." Kuo, in a move that ought but will not introduce a sense of humility in Rumor said, went on to say that he'd made a mistake. "We previously thought Apple would not release a new version of the iPad mini this year, but we now think Apple will launch an upgraded version with same form factor, A8 processor and Touch ID (fingerprint recognition) to boost shipments of iPad mini with Retina display." It would be odd if Apple launched an upgraded version to decrease shipment of a product. Padilla summarizes some of Kuo's other predictions: iPad Air 2 will launch before November 2014; that Apple will cut the price of the existing Retina iPad mini; and that Apple is "actively working" on the mythical 12.9-inch iPad, "gearing it towards uses in entertainment and productivity," but it won't appear until 2015. Kuo's passing reference to the A8 sparked a separate wave of commentary on this next iteration of the Apple-designed system-on-chip, based on the ARM Ltd instruction set. Apple surprised rivals and pundits alike in September 2013, when it introduced for the iPhone 5s the A7, with its own custom-designed cores using ARM's 64-bit instruction set, the first mobile processor to do so. The actual 64-bitness of the chip, so far, has a minimal impact on performance. But the shift to ARM64 let Apple exploit a bunch of other changes ARM introduced, and make a number of changes of its own. The result was a dramatic performance gain. OS X/iOS programmer Mike Ash, in an excellent post on the meaning of the A7's 64-bitness, summarized the results: "The 64-bit' A7 is not just a marketing gimmick, but neither is it an amazing breakthrough that enables a new class of applications. The truth, as happens often, lies in between. The simple fact of moving to 64-bit does little. It makes for slightly faster computations in some cases, somewhat higher memory usage for most programs, and makes certain programming techniques more viable. Overall, it's not hugely significant." What is significant is the increased number of registers, and a revised, streamlined instruction set, "for a nice performance gain over 32-bit ARM," he writes. Apple's own changes are highly technical but have to do with 1) allowing Objective-C code to create and destroy objects twice as fast as before and 2) the use of "tagged pointers" which "make for a nice performance win as well as reduced memory use." So what's next? CNET's Brook Crothers was refreshingly, and accurately, direct in posting about Kuo's A8 prediction: "Little is known about the A8 processor, but it would be logical to expect that Apple will take its desktop-class' 64-bit computing strategy to the next level with the A8," he wrote. It's a comment that just about covers all the bases given the current state of the iOSphere's non-knowledge. Crothers did link to one of his earlier posts about a report issued earlier this month by JP Morgan (and initially covered by Barron's Tech Trader Daily), arguing that Apple, in effect, ought to use the expected gains in the A8 to create a new category of product: a laptop-table hybrid running iOS. According to JP Morgan Rod Hall, such a device would make Apple a player in a $63 billion market opportunity, for laptops in the $500-1,000 price range. Hall apparently doesn't have much to say about the A8 itself, but he does claim that it "likely to surpass the computing power of current [Intel] i5-based MacBook Airs...If our calculations are roughly correct, we would see no reason for Apple not to begin using the A8 in its laptops or -- as we are arguing in this report -- just make its tablet behave as a laptop." Hall doesn't expand on what it means to "make the iPad behave like a laptop." Probably because no one seems to know what that would mean. The dilemma was highlighted by former Apple executive Jean-Louis Gass�e, in his MondayNote blog this past week. He was writing in expectation that Apple would likely report that iPad sales, for the first time, had decreased in absolute numbers in FY Q2 compared to the year-before-quarter, which in fact did happen as Apple disclosed yesterday in its Q2 2014 earnings. "Apple's hopes for the iPad overshot what the product can actually deliver," Gass�e wrote. "Although there's a large numbers of iPad-only users, there's also a substantial population of dual-use customers for whom both tablets and conventional PCs are now part of daily life. I see the lull in iPad sales as a coming down to reality after unrealistic expectations, a realization that iPads aren't as ready to replace PCs as many initially hoped." He recalls that in introducing the first iPad in January 2010, Steve Jobs explained onstage that the iPad would "find its place between the iPhone and the Mac." "This in-between place' is still elusive," Gass�e writes.